With so many staff, rosters and records in general, it’s inevitable that you may need to dig deeper to investigate what happened to certain shifts or why they’re costing a certain way. Whether it’s a surprising payroll cost or a missing shift, you can always investigate further to determine what’s going on. If you need to locate a shift, even if it’s deleted, a super manager can always look for it in the Shift History. 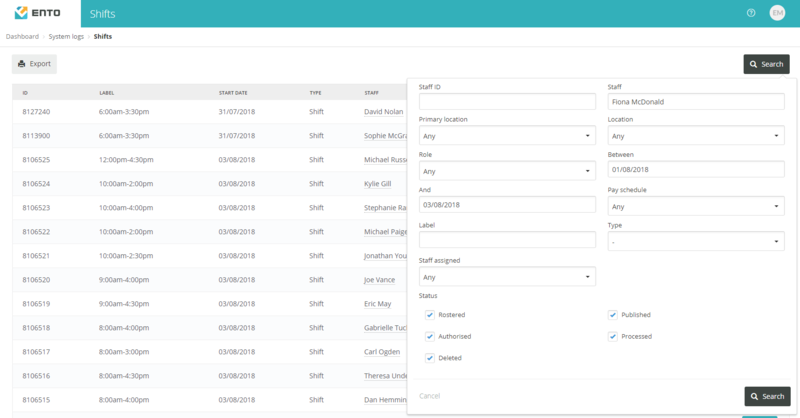 The ‘Search’ function on this page allows you to tick a box to include Deleted shifts, so simply filter down by employee, date, location, etc. to help narrow down the results to what you’re after. From this page, you can click the ‘View’ button to open a historical view of all shifts. Tip: You can also view this historical view by clicking a shift in the roster and choosing ‘View shift details’, or clicking the ‘View’ button on the timesheets page. Some managers may not have access to the Shift History page, so can always see it for other shifts in this way. On the details page, hovering over the label will show you the main details at each step, including the shift label, times, staff, hours, etc. It will also list what has changed compared to the last state of the shift (if anything). You can then click the ‘View’ button on each row to see the costing information for that specific version of the shift as well. This breakdown shows the shift split into its different earning periods. For each period it lists what the earning rate is (eg. Ordinary, Overtime, Night shift, Saturday, etc), and what conditions it hit that caused that rate (eg. Over 38 hours into the week, over 10 hours into the day, between 7pm and 7am, etc). The paycycle page allows you to dig quite deep into the pay information of each paycycle, even though it displays a deceptively simple summary on the initial page. Only unprocessed paycycles will show by default. You can view any processed paycycles using Search and ticking the appropriate box to include them in results. Once here, you can drill down onto each by clicking the ‘View’ button, which takes you to a list of all staff in that paycycle, including a summary of their award, standard hours, hours worked, and cost. This again lets you view a nice summary of all staff to quickly check that they’re all approximately as expected. Heading further in by clicking ‘View’ on each staff member again, you can then see a list of earning rates that they’re to be paid for this paycycle. Ento advises how many of each type, so you can see how many ordinary hours they’re paid for, how much overtime, how many Saturday/Sunday hours, etc. If you then want to see why they were paid overtime, for instance, you can click ‘View Details’ at the top of the page to see a breakdown of each of their earning rate periods across the pay cycle, so you can find out where certain costs/hours occurred. You’re then able to investigate the shift as in the previous section to find out more. Just click the shift label and it’ll take you to that shift’s breakdown. This should provide a substantial summary/explanation for the costing or history of a shift. If you have any questions or concerns about a shift or cost, feel free to reach out to our Support team using the built-in chat on the left side of your screen for assistance.